No particular degree program is considered ideal or preferred in preparation for entry to the MD Program, nor is any preference given to a particular institution attended; we welcome applicants from a variety of academic backgrounds. As each year there are many more qualified applicants than positions available, students should enroll in programs which reflect their strengths and interests and to have an alternative career option should their application be unsuccessful. Adjusted academic average In addition to the overall academic average, an adjusted academic average is calculated for certain applicants. In the adjusted academic average the academic year with the lowest academic average will be dropped (if applicable). At most, 30 credits can be dropped. If more than 30 credits are presented in the worst academic year, the 30 credits with the lowest grades will be removed. In order to have the academic year with the lowest academic average dropped, applicants must have 90 credits with grades remaining by June 1 of the application year. Courses in progress from June 1 onward do not count toward the AGPA. Note: Courses taken during the summer of the application year are treated as courses in progress. They are excluded from academic average calculations and do not count toward the credits needed for the AGPA, but will ultimately count for credit towards the 90 minimum credits and/or completion of the English requirement. Summer courses from past years are included in the academic evaluation. AP, IB and A Level credits are not included in GPA calculations. If the academic year with the lowest GPA has less than 30 credits, we will subtract the number of credits in that year from your GPA credit total. If the resulting answer is 90 or more we will remove the entire worst year. If the academic year with the lowest GPA has 30 credits or more, we will subtract 30 from your GPA credit total. If the resulting answer is 90 or more we will remove the courses with the lowest grades from the worst year, up to 30 credits. • if any English or recommended science courses are eliminated, these do not have to be retaken. 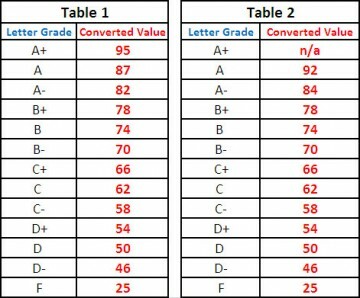 Grade Conversion: These Grade Conversion Tables will be used to convert applicants’ letter grades to a percentage. Depending on the grading scheme of a particular institution attended, each letter grade will convert to the same percentage grade as per the appropriate table. These conversion scales were approved solely for use in academic evaluations of applications to the UBC MD Undergraduate Program. The resulting averages may differ from those calculated by your institution. Grades from schools using a percentage system will not be converted. These tables may be used by applicants to convert grades from their transcripts to the percentages shown. This will assist in determining eligibility to apply to the MD Undergraduate Program. However, applicants should be aware that in the event of a discrepancy between their calculations and those of the Admissions Office, our decision is final. Table 1 is used for institutions that award an A+; Table 2 is used for institutions that do not. MCAT Scores: The minimum MCAT requirement for applying to our program is a score of 124 in each section (CARS, BBFL, CPBS and PSBB) on one exam. Applications with scores lower than 124 in any section will be made ineligible. Applicants should review our statistics for an indication of competitive scores. If you have written the MCAT more than once, we will evaluate your best eligible exam. Please note that our evaluation is based on only one exam; we do not take sub-scores from individual sections of different exams. Pre-Interview: The first cut-off for invitation to interview is based on a score derived from applicants’ Overall Academic Average or Adjusted Academic Average (if applicable) and a Non-Academic Qualities Score. At this stage the academic and non-academic scores are weighed equally. MCAT scores, so long as minimum requirements have been met, are not taken into consideration at this stage. Post-Interview: All aspects of applicants’ files are looked at. The Admissions Selection Committee will consider that applicants, whatever their particular academic background, have demonstrated they are likely to perform well in the rigorous curriculum and case-based format of the program. Assessment of academic performance also includes reviewing trends in grades from year to year as well as senior undergraduate and graduate level achievements completed by application deadline. Motivation, social concern and responsibility, creativity, scientific and intellectual curiosity, attitude toward continuing learning, maturity, integrity, and realistic self-appraisal, are just a few examples of important non-academic qualities. In an effort to select well-rounded, mature, empathetic and caring individuals who will be best suited for success in medicine, the non-academic section of the application is given significant weight in our evaluation. Activities and achievements are reported and evaluated using the following categories: leadership, service ethic, capacity to work with others, diversity of experience, and high performance in an area of human endeavor. Within each category, a variety of factors are considered when assigning a score. Generally, higher scores are assigned to activities that demonstrate significant levels of responsibilities, initiative, and commitment over activities with minimal duration or degree of responsibility. We seek activities which showcase intentional, genuine concern for others, demonstrated by long-standing volunteer commitments or employment in a caring industry. No preference will be given for applicants gaining experience abroad, versus those seeking to choose activities close by. We also look for significant involvement and interaction with people from various backgrounds and abilities beyond your normal peer group. We also consider additional skills, competencies, and understandings gained as a result of diverse life experiences. Each category looks at different experiences with concepts such as life experience in general, life experiences outside one's comfort zone, degree of involvement, roles and responsibilities, levels of accomplishment and duration of activity. Applicants are evaluated on their non-academic activities and interests which demonstrate the following aptitudes: motivation, social concern and responsibility, creativity, scientific and intellectual curiosity, attitude toward continuing learning, maturity, integrity, and realistic self-appraisal, among other qualities. If applicants are intending to strengthen the non-academic portion of their application, they should pursue activities that are of interest to them and which will prepare them for a career in medicine. Intentional community involvement is valued and can encompass a variety of experiences within and outside of the health care setting, in paid or volunteer positions. The intensity of the activity as well as the time commitment are just two aspects which are considered by evaluators. Please note that just as applicants are required to demonstrate above-average academic abilities, a good NAQ score requires demonstration of above-average non-academic qualities. Verifiers for non-academic experiences (including activities and employment history) can be contacted at any time from the date of application submission until mid-April of the following year. Verifiers are contacted to confirm specifics of an activity and can also be contacted at random. Discrepancies between the details in your application and those confirmed by the verifier are noted and may affect your file. Applicants are strongly encouraged to ensure the information they provide is accurate. Applicants interested in pursuing medicine in northern, rural or remote communities are encouraged to complete the Rural and/or Northern Training section of the application, used to help determine the suitability of applicants for the Northern Medical Program and a select number of positions in the Southern Medical Program and the Island Medical Program. Experiences in rural/remote/northern/Indigenous settings, along with community ties and relevant activities, factor into the assessment. The Faculty of Medicine will interview a sub-set of applicants, based on results of file reviews of academic and non-academic evaluations. The interview is an important component of the admission process. The interview process follows the Multiple Mini-Interview (MMI) model which exposes an applicant to approximately 10 interviewers and requires that he/she deal with a carefully pre-selected scenario/situation within a determined timeframe. The interviewers typically consist of a combination of academics, clinicians, community representatives and UBC 3rd or 4th year medical students, representing diverse geographic areas of British Columbia. Candidates are selected after review and decisions are made by committee consensus. Meeting the minimum admission requirements does not guarantee admission to the program. The number of qualified applicants significantly exceeds the number of available positions. Students considering applying to the program should review the detailed statistics on our website and compare their profiles. Due to the intense competition, and limits on the incoming class size, not all qualified applicants will be offered admission. Qualified candidates who are not admitted are welcome to reapply in any subsequent year, and may do so without prejudice. The selection of candidates for admission to the UBC distributed MD undergraduate program is governed by guidelines established by the Admissions Policy Committee and Senate of UBC. The selection process reflects the values of the UBC Faculty of Medicine and all university partners in the UBC distributed MD undergraduate program. The process is designed to choose well-rounded students from a variety of backgrounds who meet the goals of the expanded, distributed program; who can be expected to perform well in the rigorous curriculum and case-based learning format; and who can balance and enrich their academic experience with strong non-academic skills and interests. The UBC Faculty of Medicine’s Executive Associate Dean, Clinical Partnerships and Professionalism oversees the selection process to ensure that all applicants are given careful consideration without regard to age, gender, race, religion, sexual orientation, marital, or economic status. The Admissions Selection Committee reviews and discusses interviewed applicants. At present, admission is limited to Canadian citizens and permanent residents of Canada. A maximum of 29 positions may be made available to out-of-province applicants in the medical program each year. In completing the online application, candidates will provide information to help determine their suitability for the Northern Medical Program. The applicant will have the opportunity to indicate their site preferences after their interview. Members of the Selection Committee are not aware of an applicant’s site preference during the selection discussions. Following an admissions decision, applicants offered admission are allocated to sites based on their preferences. The site choice of the accepted student is given priority, unless the available positions at that site have been filled, in which case he/she would be wait-listed for a preferred site(s). Acceptance of admission to the MD undergraduate program is site specific.